A domed cast iron garage sign featuring the "Camel Trophy" branding. 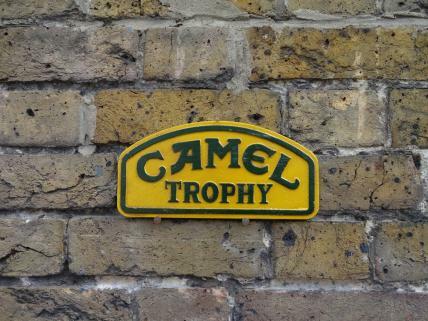 This commemorative plaque celebrates the Camel Trophy off-road adventure race that ran from 1980 to 2000. The colour scheme is the same as that of the original Land Rover vehicles that were used during the tough endurance race - green lettering with a sand colour background. Easy to mount on a wall or vehicle. These signs represent the spirit of adventure and the toughest terrain on Earth, and so are loved by 4x4 automobilia enthusiasts everywhere.